As wildfires ignite forests into ashes, orbiting satellites track where they burn and how severe they are. Specifically, satellites capture wildfires as they happen and stream this information in active fire maps. So in near real-time, decision-makers have at their fingertips critical information for saving money and preserving life. But which active fire maps can you track wildfires in real-time? And which wildfires web services, shapefiles and KML/KMZ are available? Also, what satellites are tracking forest fires in near real-time? And how can you see this satellite imagery for yourself? Google Earth Pro is a handy tool that helps you sight-see the planet. And the best part is that it’s never a cloudy day. Even though imagery is usually less than a year old, chances are that you wont see a forest fire in the application. But really, all it takes a bit of legwork to get started. First, download the latest active fire data from NASA. Next, drag and drop the KMZ into Google Earth Pro. As you can see above, the latest forest fires will pop up with fire symbols. 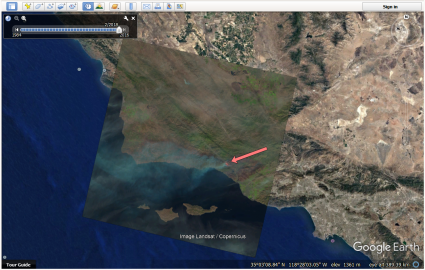 If you want to see a snapshot of the fire, your best chance is using a Landsat scene from the USGS Earth Explorer. Fortunately, we have a tutorial how to download Landsat data. Select your area, time frame and choose Landsat-8. The image type you want is Landsat Look with Geographic Reference (about 10MB). Download it. Finally, drag and drop the Landsat image into Google Earth Pro without any extra processing. If you downloaded the correct date and time, you should be able to see the forest fire. As you can see below, here is a satellite view from the December 2017 wildfires in California. Not only is Google Earth Pro good for active forest fires, but also for measuring the footprint of the burned area. It’s easy to get confused with clouds for Landsat images, so you can verify the fire with thermal infrared (TIR) and the KMZ. 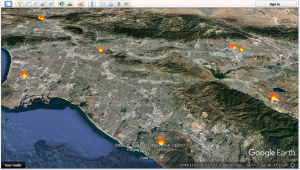 Not only is NASA Worldview an active fires map, but it’s also a live imagery map. So this means that you can see forest fires and (coarse) imagery as they are collected in near real-time. If you want to view fires in Worldview, click “Add Layers” and it has a whole category for fires data. 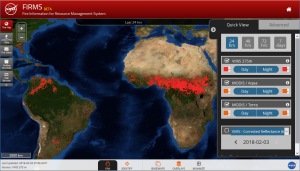 If you need better imagery for a basemap, NASA’s Fire Information for Resource Management System (FIRMS) is a feature-rich interactive fire map. In this web map, you can visualize daily global fire locations within 3 hours of satellite overpass from both MODIS and VIIRS satellites. More on these sensors later. 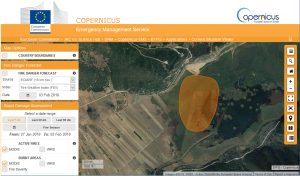 Lastly, the Copernicus Emergency Management Services targets users in Europe. Similar to the other active fire maps, the European Forest Fire Information System (EFFIS) uses MODIS and VIIRS to track thermal anomalies. As part of their current situation viewer, it assesses the burnt area of the forest fire with a polygon extent. In addition, it provides analysis on seasonal trends and the number of fires by European Union countries. For fire prevention managers, this platform forecasts fire danger level based on meteorological predictions. History shows that when wildfires get out of hand, they can be costly and deadly to people nearby. Fortunately, satellites can track forest fires and deliver warnings to emergency crews. The fire detection algorithm compares the temperature of a potential fire with the temperature of the land around it. If the difference is over a given threshold, it confirms the “hot spot” as an active fire. But if the fire is too small to detect due to the spatial resolution of the sensor, the satellite won’t be able to detect it. MODIS: On board Terra and Aqua satellites, MODIS has a pixel resolution of 1 km. As explained above, it detects active fires by comparing temperature to neighboring pixels but it depends on the severity and extent of the fire. VIIRS: Likewise, VIIRS on board the NASA/NOAA Suomi NPP detects active forest fires based on thermal anomalies. Because of its finer spatial resolution (375 meters), it can detect smaller fires on the ground with a bit more accuracy. Detecting forest fires is just one of the hundreds of remote sensing and satellite applications in use today. Mineral extraction, natural gas as well as potential shipping routes. These Arctic Maps display one of the last great frontiers for human development.